Ceres' Occator Crater, and its bright spots, in 3D. The inner part of the crater forms a type of "crater within a crater" measuring about 0.6 miles (10 kilometers) in diameter and 0.3 miles (0.5 km) in depth. The mysterious bright spots on the dwarf planet Ceres may be composed of the same basic stuff that makes a foot bath feel so good, a new study reports. Observations made by NASA's Dawn spacecraft, which has been orbiting the dwarf planet since March, suggest that Ceres' many bright spots could be made primarily of hydrated magnesium sulfates. Here on Earth, magnesium sulfate is sold as Epsom salt, a popular home remedy for a variety of ailments, including sore feet and joint inflammation. Scientists released an amazing new video of Ceres' bright spots in crystal clarity along with their new findings today (Dec. 9). The study team, led by Andreas Nathues of the Max Planck Institute for Solar System Research in Germany, counted 130 bright spots across the surface of Ceres, which, at 590 miles (950 kilometers) wide, is the largest object in the asteroid belt between Mars and Jupiter. Mosaic showing 130 bright spots on Ceres. Top left: A haze appears above Occator Crater when the sun hits it, suggesting the crater contains subsurface water ice. Top right: A kind of haze also appears above Oxo Crater, the second-brightest structure on Ceres. Bottom: A typical crater without water. These whitish patches are mostly associated with impact craters, the team found, and they're much brighter than Ceres' surface as a whole, which is about as reflective as freshly poured asphalt. The spots, by contrast, range in brightness from that of concrete to the reflectivity of ocean ice. The nature of the bright spots has spurred a great deal of speculation over the past year or so, with most scientists positing that they're composed of water ice or some type of salt. The framing camera data bolster the salt hypothesis, Nathues and his colleagues report in the new study, which was published online today (Dec. 9) in the journal Nature. For example, the closest match for the middle of the brightest spot in 56-mile-wide (90 km) Occator Crater — which harbors the most dramatic and most famous collection of Ceres bright spots — is a type of hydrated magnesium sulfate known as hexahydrite. The composition appears to shift toward less-hydrated kinds of magnesium sulfate at greater distances from the center of the Occator spot, according to the researchers. However, this interpretation is not ironclad, the study team stressed. "Because of the absence of strongly diagnostic absorption features in the wavelength range of the FC, any identification of specific phases must be considered tentative," the researchers wrote in the study. NASA's Dawn spacecraft is the first ever to visit two targets in the asteroid belt, Vesta and Ceres. See how NASA's Dawn spacecraft will visit the asteroids Vesta and Ceres in this Space.com infographic. Ceres' relatively low density suggests that the dwarf planet is about 25 percent water by mass, most of which is probably locked up in a subsurface ice mantle. And, while Ceres' spots are likely salt deposits, water ice does seem to be involved in their formation. Dawn scientists announced earlier this year, for example, that Occator Crater at times contains a layer of haze presumably created by volatile material subliming into space from the bright spots. And Europe's Herschel Space Telescope spotted water vapor coming from the vicinity of Occator, astronomers announced in January 2014. Each of Ceres' bright spots was probably active like those in Occator Crater at some point in the past, the researchers wrote. "The simplest scenario is that the sublimation process of water ice starts after a mixture of ice and salt minerals is exposed by an impact, which penetrates the insulating dark upper crust," they wrote in the study. "For sure we will get better insights into the processes," Nathues told Space.com via email. The global distribution of the bright spots indicates that Ceres once harbored (and may still harbor) large amounts of water ice near its surface, study team members added. 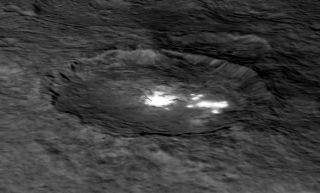 The new Dawn results, combined with the detection of haze in Occator Crater and Herschel's discovery of water vapor, "suggest that an icy or water shell containing salts exists in Ceres," Nathues said. "Thus Ceres is at least partially differentiated in the mineralogical sense." The knowledge that Ceres is a differentiated body will help researchers better understand the dwarf planet's formation and evolution, Nathues added. When sunlight reaches Ceres' Occator Crater, a kind of haze of dust and evaporating water forms there. This haze can only be discovered by looking at it laterally, as has been done here. A second study in the same issue of Nature also sheds some light on Ceres' early days. A separate research team, led by Maria Cristina De Sanctis of the Institute for Astrophysics and Space Planetology in Rome, studied observations made by Dawn's Visible-Infrared Mapping Spectrometer (VIR) instrument. The VIR data show that clays containing ammonia are widespread across the surface of Ceres. This ammonia probably came from the outer solar system, because ammonia ice is not stable at the relatively warm temperatures of the asteroid belt, the researchers wrote. So Ceres itself may have formed far away from the sun — perhaps out beyond Neptune — and then migrated inward to its current position. "The implantation of Ceres in the main belt could have taken place during a migratory phase of the giant planets, either during their growth in the protoplanetary disk, or at a later time as a result of an orbital instability," De Sanctis and her colleagues write in their Nature paper. This artist's illustration shows two different hypotheses regarding the formation of Ceres. Top: Ceres formed in the main asteroid belt, and ammonia was incorporated from the solar system's outer reaches. Bottom: Ceres itself formed far from the sun, including ammonia in its formation process, and then migrated to the asteroid belt. But it's also possible that Ceres may have formed where it now lies and accreted pebble-size, ammonia-rich objects that drifted in from the solar system's outer reaches. "We cannot discriminate between the two hypotheses," De Sanctis told Space.com via email. "These are based on dynamical modeling of the early phases of planet formation, and both can be right. We need more observations and models to understand what is more likely."